On a cold winter’s night a small private plane took off from Clear Lake, Iowa bound for Fargo, N.D. It never made its destination. Performing in concert was very profitable and Buddy Holly needed the money it provided. “The Winter Dance Party Tour” was planned to cover 24 cities in a short 3 week time frame (January 23 – February 15) and Holly would be the biggest headliner. Waylon Jennings, a friend from Lubbock, Texas and Tommy Allsup would go as backup musicians. Ritchie Valens, probably the hottest of the artists at the time, The Big Bopper, and Dion and the Belmonts would round out the list of performers. The tour bus developed heating problems. It was so cold onboard that reportedly one of the drummers developed frostbite riding in it. When they arrived at the Surf Ballroom in Clear Lake, Iowa, they were cold, tired and disgusted. Buddy Holly had had enough of the unheated bus and decided to charter a plane for himself and his guys. At least he could get some laundry done before the next performance! That night at the Surf Ballroom was magical as the fans went wild over the performers. Jiles P. Richardson, known as The Big Bopper to his fans, was a Texas D.J. who found recording success and fame in 1958 with the song Chantilly Lace. Richie Valenzuela was only 16 years old when Del-Fi record producer, Bob Keane, discovered the Pacoima, California singer. Keane rearranged his name to Ritchie Valens, and in 1958 they recorded Come On, Let’s Go. Far more successful was the song Valens wrote for his girlfriend, Donna, and its flip side, La Bamba, a Rock and Roll version of an old Mexican standard. This earned the teenager an appearance on American Bandstand and the prospect of continued popularity. Charles Hardin “Buddy” Holley (changed to Holly due to a misspelling on a contract) and his band, The Crickets, had a number one hit in 1957 with the tune That’ll Be The Day. This success was follwed by Peggy Sue and an appearance on the Ed Sullivan Show. By 1959, Holly had decided to move in a new direction. He and the Crickets parted company. Holly married Maria Elena Santiago and moved to New York with the hope of concentrating on song writing and producing. Dwyer Flying Service got the charter. $36 per person for a single engine Beechcraft Bonanza. No, the plane wasn’t named American Pie. It only had serial numbers, N3794N. When Holly learned that Jennings wasn’t going to fly, he said, “Well, I hope your old bus freezes up.” Jennings responded, “Well, I hope your plane crashes.” This friendly banter of friends would haunt Jennings for years. Allsup told Valens, I’ll flip you for the remaining seat. On the toss of a coin, Valens won the seat and Allsup the rest of his life. The plane took off a little after 1 A.M. from Clear Lake and never got far from the airport before it crashed, killing all onboard. A cold N.E wind immediately gave way to a snow which drastically reduced visibility. The ground was already blanketed in white. The pilot may have been inexperienced with the instrumentation. One wing hit the ground and the small plane corkscrewed over and over. The three young stars were thrown clear of the plane, leaving only pilot Roger Peterson inside. Over the years there has been much speculation as to whether a shot was fired inside the plane which disabled or killed the pilot. Logic suggests that encased in a sea of white snow, with only white below, Peterson just flew the plane into the ground. Read the Coroner’s Report or the Civil Aeronautics Board Report for more info. Deciding that the show must go on at the next stop, Moorhead, MN, they looked for local talent to fill in. Just across the state line from Moorhead, in Fargo ND, they found a 15 year old talent named Bobby Vee. The crash that ended the lives of Holly, Valens and Richardson was the break that began the career of Vee. Tommy Allsup would one day open a club named “The Head’s Up Saloon,” a tribute to the coin toss that saved his life. Waylon Jennings would become a hugely popular Country singer. Dion di Mucci would enjoy a long lived solo career. Ever wonder what the words to American Pie mean? Here’s an ANNOTATED AMERICAN PIE which interprets the song! 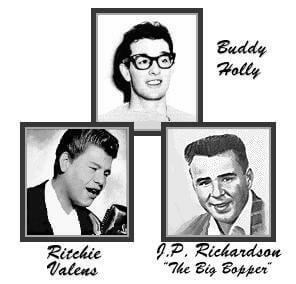 Webmaster’s note: In March of 2007 the body of J.P. “The Big Bopper” Richardson was exhumed at the request of his son, Jay Richardson. Dr. Bill Bass, a forensic anthropologist at the University of Tennessee, looked at the remains in Beaumont, Texas. A gun that belonged to Buddy Holly was found at the crash site, fueling rumors that the pilot was shot and perhaps Richardson survived the crash and was trying to get help. “I was hoping to put the rumors to rest,” the son Richardson said.